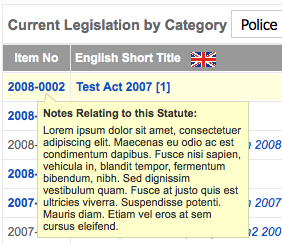 Select Legislation > Current > Category from the drop-down menu in the front-end of the web site. Row A - Is the INFORMATION row. It contains details of what is being presented in the window and a category selection list to group the results into logical categories. 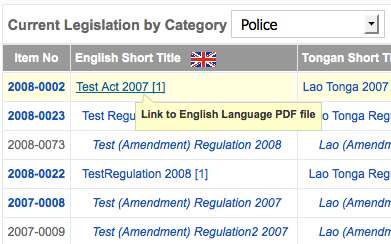 The initial view has no legislation displayed, but by selecting a category the results appear as above. Also at the far right of the window is a HELP icon. Clicking on the icon reveals this HELP screen. Row C - Is the LIST TABLE. It contains the list of legislation. Principal and Subordinate legislation contains a number at the end of the Short Title to indicate the version number (e.g. ). The version number will only display when the SETTING point-in-time is active. Category. Contains the category name.